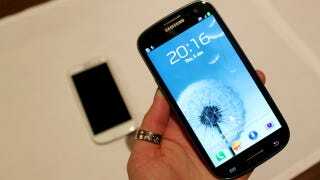 The Samsung Galaxy S III, third of its name and new king of Android phones, will be out in the US this month on all four major carriers (plus US Cellular). It'll start at $200 for the 16GB version, and scale up from there. Update: We've got availability and pricing from carriers. Verizon's GS3 will be up for pre-order June 6, with the 16GB model for the aforementioned $200 and the 32GB model will be $250. Sprint will be available for pre-order June 5, and available on June 21, at the same price as Verizon. T-Mobile's will be out June 21, but no word on the (probably not very different) pricing.